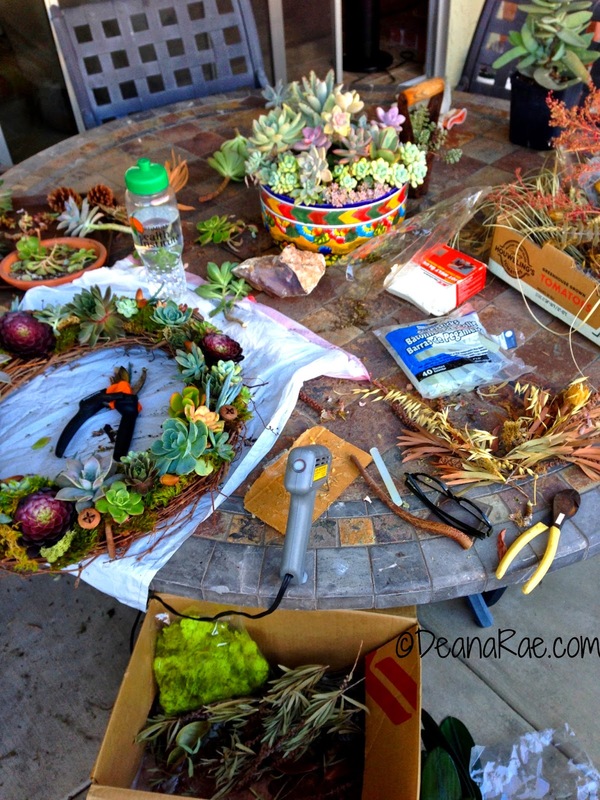 How to make a succulent wreath arrangement! Seriously can't belive this is the first one I've ever made. Having a background as a floral designer, wreath making is certainly not new to me. I have probably made 1000 wreaths over the years. But, they were mostly of silk and dried materials. I made a few with fresh flowers but never with my beloved succulents. 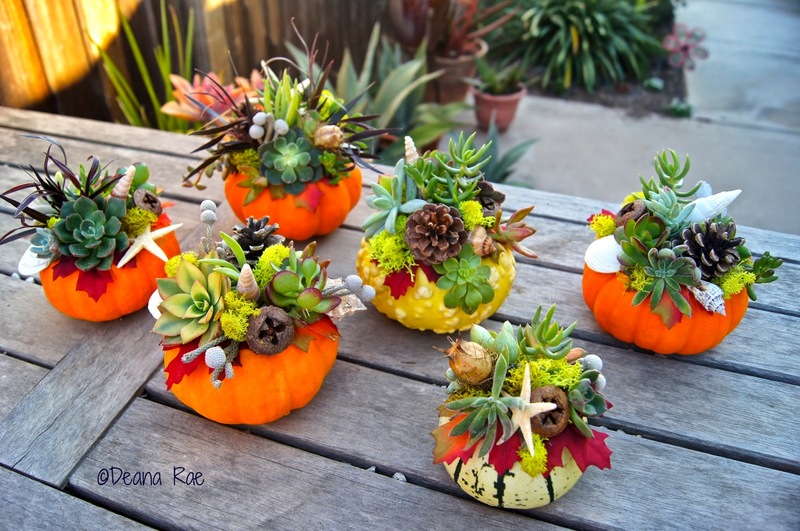 For the past two years in the fall I've made succulent topped pumpkins (photo below) with this same technique, and have seen how long the succulents last. I think the wreath will stay looking good for at least a year based on my experience with the succulent pumpkins. I plan to mist the moss at least once a week to see how that helps it last. I've read other blogs from experts, and that's what they do! 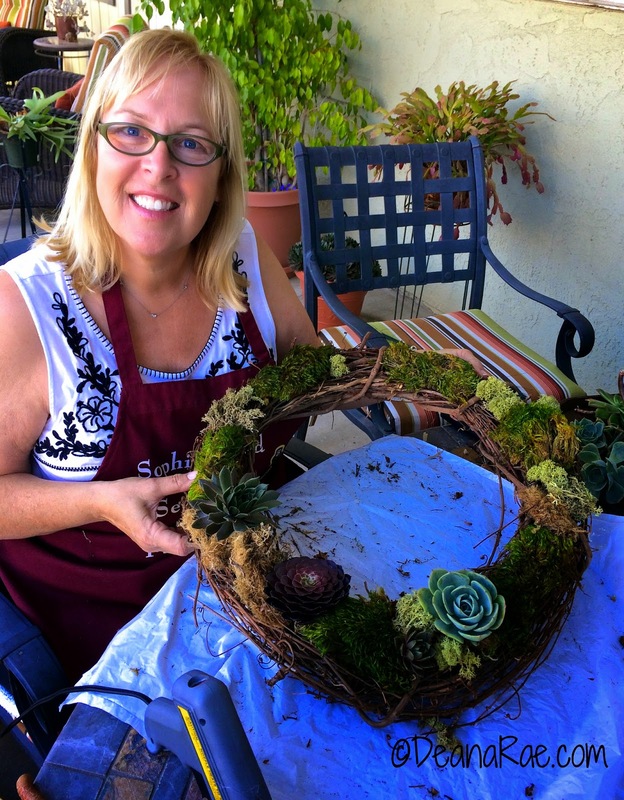 Here is a wonderful video produced by succulent guru Debra Baldwin, featuring the fanaical Katie Christensen of Waterwise Botanicals Nursery, that may help you visualize the process: How to Plant a Cold-Hardy Succulent Wreath. Of course her video shows using a moss wreath, but you can choose what ever base you want. 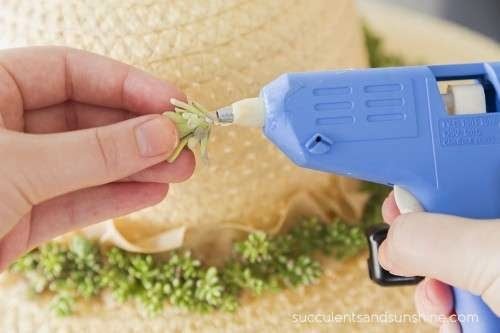 Another difference is that she uses moss pins and cold glue, so if you don't have a glue gun this gives you another option. The succulents will root in the moss and won't die. They can later be removed and planted, or just refresh the wreath but cutting them back and re-gluing them in. 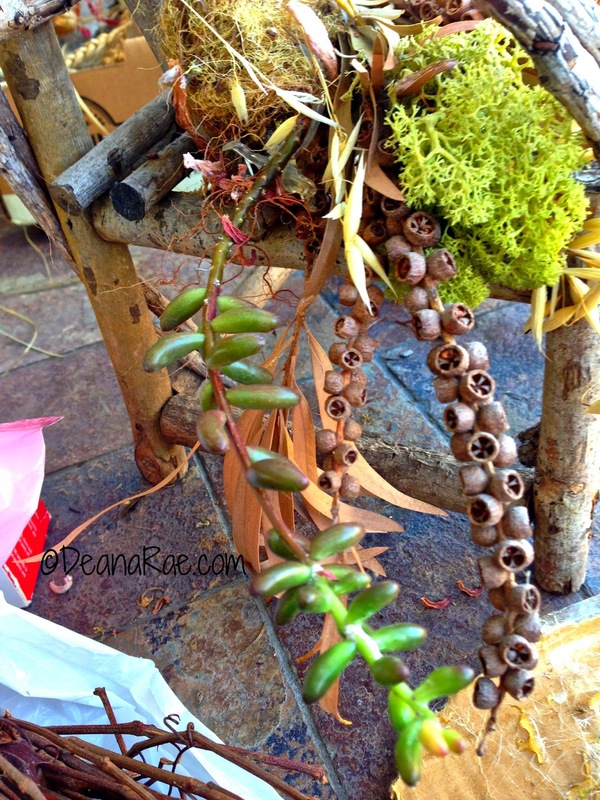 Succulent and dried arrangement made with hot glue and moss. 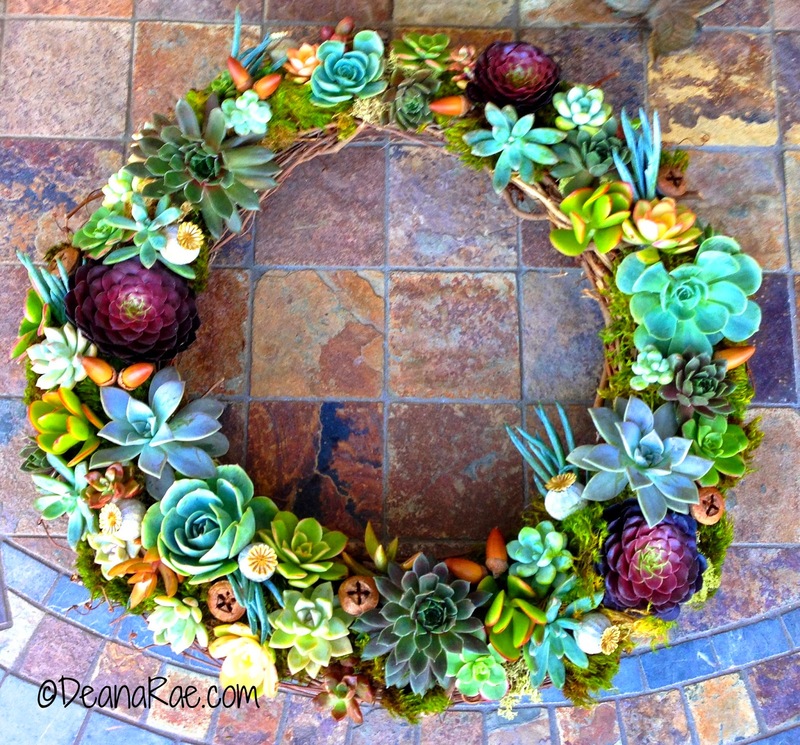 More inspiration: Here is a great article written about succulent wreaths by Succulent Gardens. You can even buy a wreath making kit from them which includes all of the cuttings. Great price and quality! 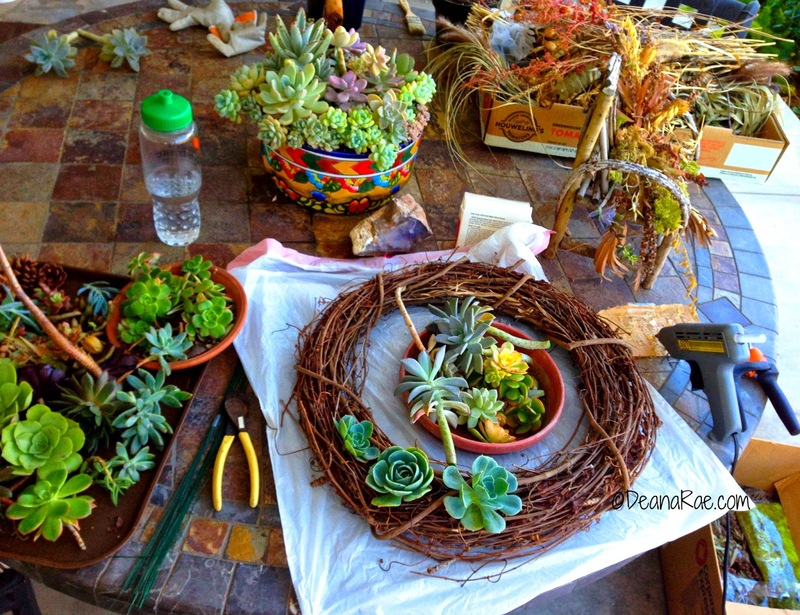 Succulent Wreaths. Succulent Gardens is a wholesale/retail nursery dedicated to the growing of over 400 varieties of quality succulent plants. The nursery covers over three acres and the plants are displayed both in greenhouses and outside. 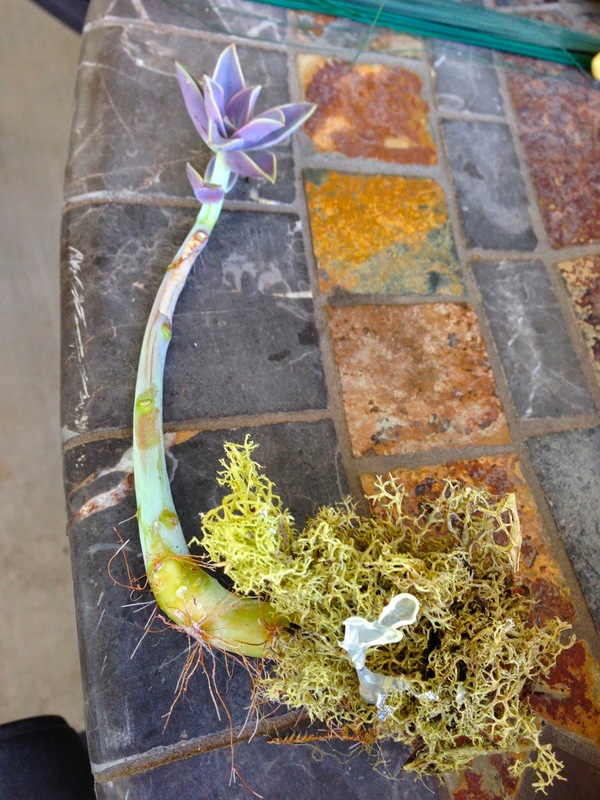 This next photo shows an example of their succulent wreath cuttings. 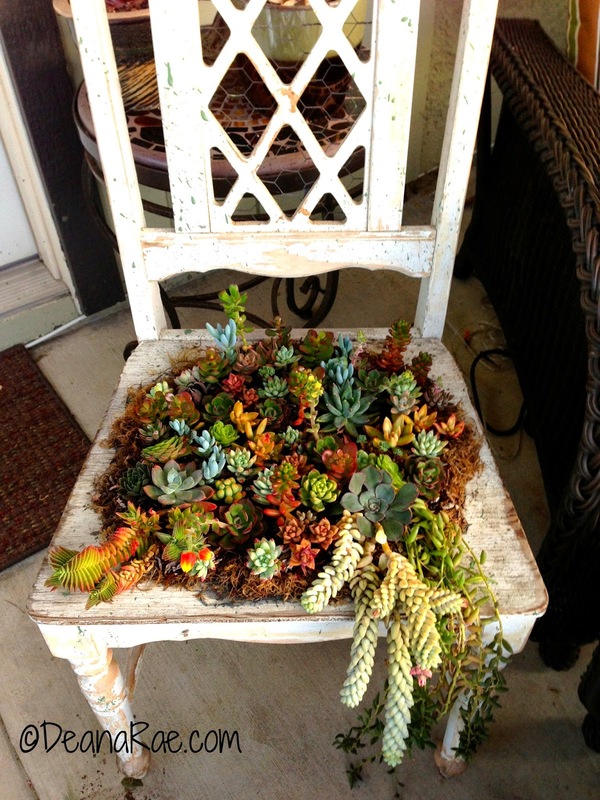 I used them for this planted chair. The possibilities are endless. Now let's get down to wreath making! I opted to use a grapevine wreath over the wire or moss stuffed wreaths because I like the look of it and I find them easily at garage sales for only $1.00. What crafter doesn't have a few grapevine wreaths laying around? Moss. I used three different types for a variety of texture and color. The best kind is the sheet moss you can buy in small bags for about $8 (spagnum moss turns brown - see photo below where I am holding the wreath). I also like the Reindeer moss and it comes in lots of colors. Sheet moss may be labeled differently in stores. This is usually how it is packaged. Reindeer moss in various colors. Succulent cuttings - I used about 55 cuttings, depends on how full you want it. Chopstick or any stick will do. I used a cut off succulent stem. 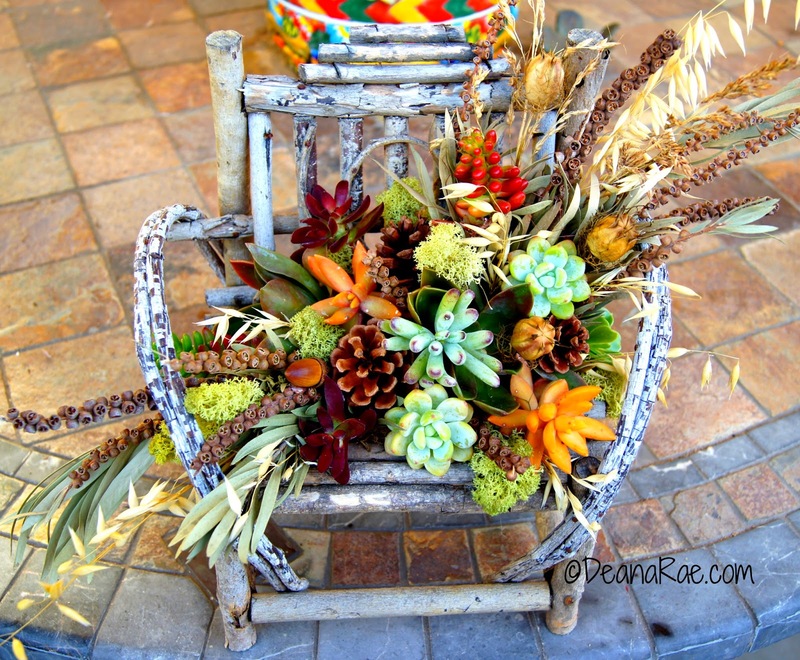 Pods, pinecones, dried materials...anything you want to add to enhance your wreath. Gather your materials and start by laying out how you want your rosettes arranged. Make yourself comfortable, it takes about 2 hours to finish your wreath. Put something down on your work surface to protect it from any glue drips. 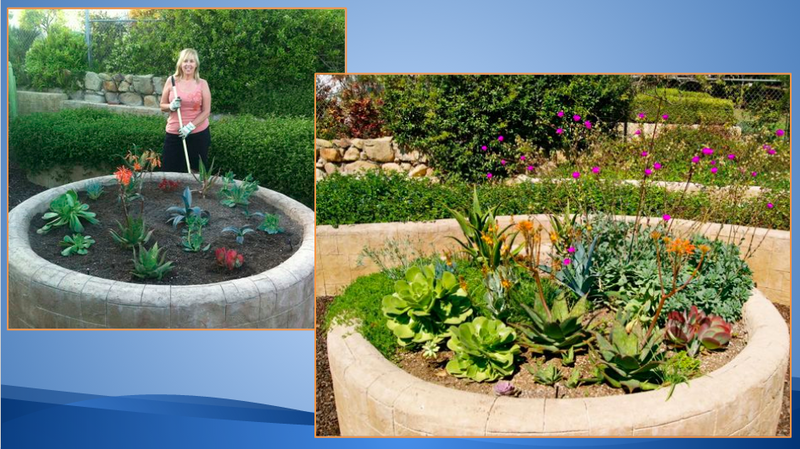 Start by laying out the larger main succulent rosettes to see how they will look. You normally want to think odd numbers, three, five, seven for your main colors and feature items. But that is not a hard and fast rule. I used cuttings from my garden, so there is a ton of variety and sizes. The cuttings you buy from Succulent Gardens gives a nice variety, just more uniform in size. Think about clipping a few larger rosettes from your collection. Don't worry, they will grow back! Next hot glue the moss on to the wreath frame. I alternated three different types. Make sure it is super secure. I used my stick to press the moss firmly onto the wreath frame to save my fingertips from getting burned by the hot glue. And yes, who hasn't burned themselves with hot glue? Be careful!!! See how the moss is secured. Then glue on your feature rosettes with space inbetween. Apply a generous amount of hot glue around the stem and touching the bottom of the rosette. Then press it firmly into the moss. You might need to make an impression into the moss with your stick, but only if the moss is too thick and hard. Just keep adding and arranging the succulents. Alternate colors and types for a good design. Make sure place a few on the sides of the wreath. For a finished look, you might want to add more moss on the sides once you are done adding succulents. It makes a mess, but it's well worth it! Last glue on any pods or embellishments you wish. I try to avoid adding a bow, but if you really want one made sure to save space for it. Now, stand back and admire your beautiful creation! And don't forget to take a photo. I assume this is Debra! Thanks!!! Hi!!! I am a fellow member of Succulent Fanatics page on FB! You do such amazing inspirational projects!!! I look forward to seeing more of your work. Thank you for sharing your skills!!! Thank you Stephanie. I am finally learning how to get this blog going. I appreciate your compliment. See you around SF! Thank you so much Sara! Sorry I didn't see your comment sooner. It was hidden on a page in the settings and I just found it today. The brand name of the moss I buy is "Super Moss." I think they sell it at Michael's or look at your local nursery. Hi. I'm also a member of the Succulent Fanatics. Love looking at all your work. Having been diagnosed with Fibromyalgia and a long time sufferer, I've turned into gardening to destress. And I'm excited to recreate some of your work fory home. You inspired me to check out the artist in me. Maria, thank you so much! I warms my heart to know that you were inspired by my designs. That makes it all worth it. I sell a few things here and there, but really do it just for the love of working with plants and letting my creative side run wild! The hot glue doesn't kill the succulents? No it does not. Strange but true! Will the succulents form roots and grow even through the glue? Yes they sure do! See the fourth and fifth photos above.